If you’re getting maps from FEMA.org or from other sources, you’re wasting about five minutes per map on unnecessary steps. 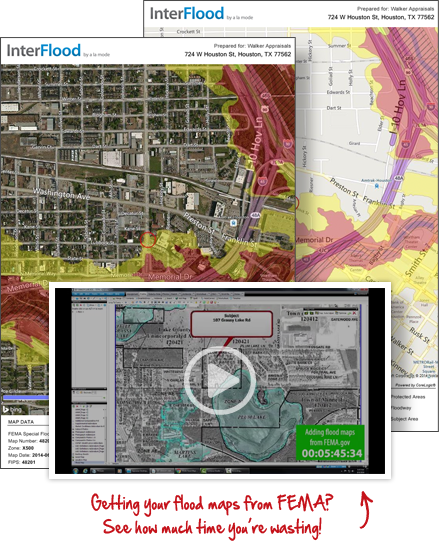 With InterFlood you’ll have full-color, perfectly-sized flood maps automatically added to your reports. They’re always current, provide nationwide coverage, and include the information you need (community, census tract, flood zone designation). At just pennies per map, there’s no reason why you shouldn’t save yourself time and add “a little extra substance” to your reports. Upgrade to Elite and get 500 flood maps included. Stop wasting time with government websites and grainy images. Quickly and automatically download high-resolution, up-to-date flood maps directly into your reports.